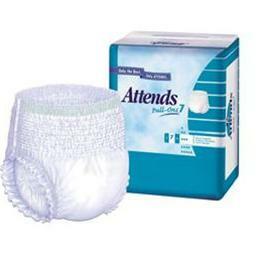 Details & Specs for Attends Pull-Ons Protective Underwear. Heavy protection. Pull up and down just like regular underwear.Clothlike stretch panels provide superior comfort and leakage barriers giveadded defense for preventing leaking.protection. Colored stichingindicates front. Tear-away sides offer an easy removal option.